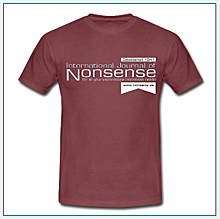 The International Journal of Nonsense is a not-for-profit publication designed to make its owners vast sums of money. It suffers massive political interference from its holding company Man Mountain Enterprises and in particular that company's chairman and chief executive Mr Groop Zaffring. It cannot, therefore be regarded as independent or impartial. The editorial team is currently subject to savage cuts and so details have not been listed here. This also implies that editorial content may not be well-researched, thoroughly checked or true. For advertisers, IJN is an ideal vehicle to reach literally three readers, two of whom may be suffering from mental uncertainty. If you wish to advertise let us know by pinning a green drawing pin to the fifth tree along Lime Tree Walk in Sevenoaks. Make sure you start counting from the right end.